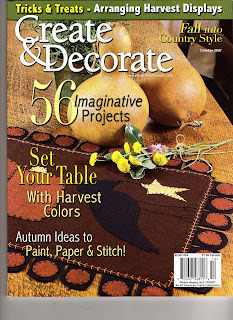 About 2 years ago, I used to design sewing projects on a regular basis for Create and Decorate magazine. I sent in a smaller, slightly changed version of one of my more popular dolls, Faithy Trumbull. I waited and waited, and over the course of a year and a half, went back and forth with the editor, Trish. For reasons I don’t understand, it seemed like that doll was never going to see publication. 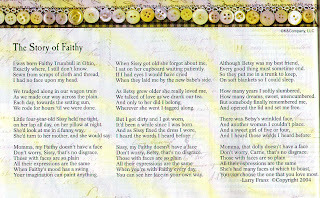 Two years have gone by, Create and Decorate has a new editor, and I’d all but forgotten about that little Faithy doll. Last week, I received a box in the mail and after opening it, I found her tucked carefully in the bubble wrap. She was home. My first thought was they sent her back because they were tired of holding on to her and I figured the new editor decided not to include her in any future issues, since she didn’t return my emails. Today, I go to my mail box and inside is a priority envelope from All American Crafts. I knew immediately what it was–the newest edition of the magazine and there was a good chance my doll was featured, otherwise why would they send me two complimentary issues? Sure enough, I page through the magazine and there she was! 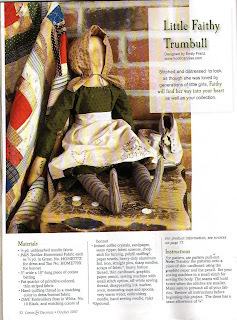 My husband also wrote a poem that goes with the doll and they included that, too! Click on the last photo and you can read it. I thought this was a little serendipitous…I’m so excited and now I want to design more for this magazine. What a nice surprise! I’m so delighted and pumped to do more. This is just what I needed….believe me! Congratulations!! Sometimes it just takes forever for good things to happen. A well earned congrats Em~ I will be looking for the magazine. Sometimes it takes awhile to hit the stands in the Boondocks! I LOVE the poem that your husband wrote. What a gift you have in him! Enjoy all good things your way!